Providing you the best range of shell and tube type heat exchanger, parallel and counter flow heat exchanger, plate type heat exchanger, specific heat of air apparatus, thermal conductivity of insulation powder and stefan boltzman apparatus with effective & timely delivery. Typical industrial applications for Shell and Tube Type Heat Exchanger include Oil transformer cooling; Exhaust gas heat recovery and Steam heating. Apparatus is Straight Tube Single Pass type Shell type heat exchanger Shell is made of clear Perspex and Tubes are copper. There is Arrangement for Counter and Parallel Flow. Temperature indicators are placed to measure hot water inlet and outlet as well as cold water inlet and outlet temperature. Effectiveness and LMTD values of the heat exchanger can be determined. A heat exchanger are widely used in refrigeration, air conditioning, power plants and automobiles. 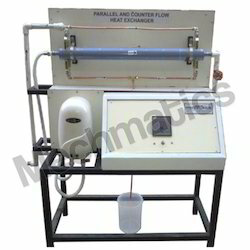 The apparatus allows heat exchange between hot and cold water in both parallel flow and counter flow fashion. This is made possible with the help of simple valve arrangement. Temperature indicators are placed to measure hot water inlet and outlet as well as cold water inlet and outlet temperature. Effectiveness and LMTD values of the heat exchanger can be determined. Plate Type Heat Exchanger are highly efficient and commonly used in low temperature applications such as refrigeration and air conditioning. The apparatus allows heat exchange between hot and cold water in counter flow fashion. Temperature indicators are placed to measure hot water inlet and outlet as well as cold water inlet and outlet temperature. Effectiveness and LMTD values of the heat exchanger can be determined. 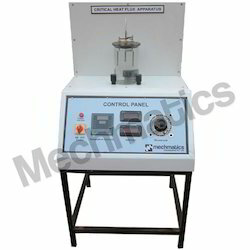 Set up is designed to evaluate the Specific Heat of Air at constant pressure. 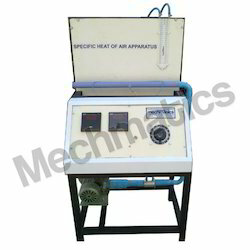 The Specific Heat of Air Apparatus has a Constant speed fan with variable flow control valve The heater is located at the center of the test section. The forced air flowing through the pipe causes the heat transfer due to convection process. Specific Heat is evaluated by taking the heat balance between heat supplied by heater and heat gained by air. 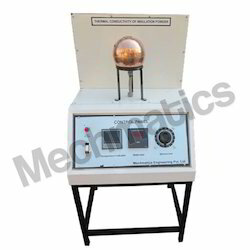 The apparatus consists of two thin walled concentric copper spheres. The inner sphere houses the heating coil. The insulating powder is packed between the two shells. The power supply to the heating coil is adjustable. Thermocouples are embedded on the outer surface of the inner sphere and inner of the outer shell. The most commonly used law of thermal radiation is the Stefan Boltzmann’s Law. The Stefan Boltzman Apparatus is designed to determine the Stefan Boltzmann constant for the given material. Flanged Hemisphere is fixed in a flat non-conducting plate. Outer surface of the hemisphere is enclosed in water jacket heated separately. 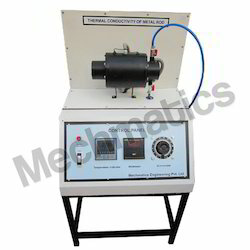 Thermocouple measures mean temperature, and the response of temperature with time on a disc fitted at centre is used to calculate the Stefan Boltzmann constant. Thermal conductivity is the intrinsic property of a material which relates its ability to conduct heat. It's study is important in engineering heat transfer application as materials of high thermal conductivity are widely used in heat sink applications and materials of low thermal conductivity are used as thermal insulation. This experiment aims at calculating value of thermal conductivity of given Metal rod using a well-engineered experimental setup. A Metal Bar, one end of which is heated while the other end projects inside cooling jacket. The middle potion is surrounded by cylindrical shell filled with insulating powder. Thermocouples are placed on rod, shell and cooling jacket to determine thermal conductivity. Water flow rate is also measured. Knowledge of surface emissivity is important both for accurate non-contact temperature measurement and for heat transfer calculations. 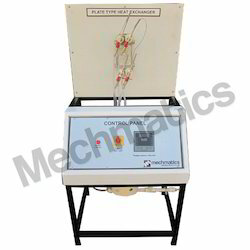 Experimental setup consists of two circular plates identical in size and are provided with heating coils. 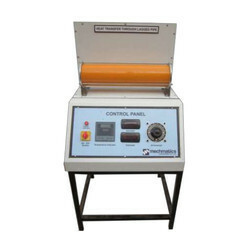 The plates are kept in an enclosure and heat input can be varied by regulators and is measured by an ammeter and voltmeter. Each plate has thermocouple and one to read the chamber temperature. One plate is blackened by a layer of enamel black paint to form the idealized black surface whereas the other plate is the test plate. The aim is to measure the emissivity of the test plate surface. Insulating materials reduce heat fluxes. As the thickness of insulating material increases, the thermal resistance increases. However, adding layers of insulation to curved surfaces, such as cylinders and spheres, increases the surface area for convection. This may actually increase the heat transfer. 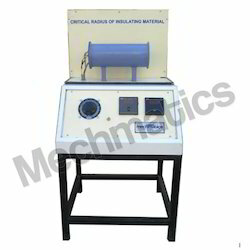 The apparatus is used to determine critical radius for insulated cylinders by determining heat transfer coefficient and the thermal conductivity of the insulation. Critical heat flux describes the thermal limit of a phenomenon where a phase change occurs during heating which suddenly decreases the efficiency of heat transfer. The understanding of CHF phenomenon is important for safe and economic design of many heat transfer units including nuclear reactors, fossil fuel boilers, fusion reactors, electronic chips, etc. 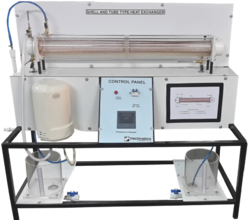 The experiment is designed to illustrate the characteristics of the boiling phase change phenomenon. It involves observing the rate of boiling of a saturated liquid on the surface of a submerged hot wire object and measuring the variation of the object temperature with time. The objective of this experiment is to observe the regimes of nucleate, transition, and film boiling in a pool of saturated liquid, to determine the rate of boiling, and to construct the boiling curve. Composite materials are widely used for purposes associated with transfer of heat. Therefore it is important to determine the rate of heat transfer through different layers of composite wall and develop expressions that model the heat transfer in composites. The experimental set-up consists of test specimen made of different materials aligned together on both sides of the heater unit. The first test disc is next to a controlled heater. 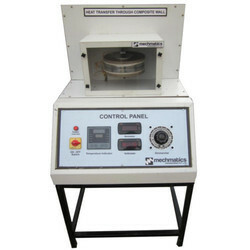 The temperatures at the interface between the heater and the disc is measured by a thermocouple, similarly temperatures at the interface between other discs are measured. The whole set-up is kept in a convection free environment. 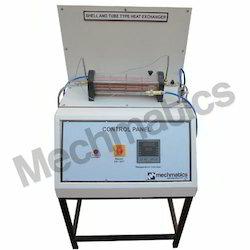 The apparatus is used to determine the overall heat transfer coefficient using natural convection. A Rectangular Duct with open ends has a vertical brass tube with heater fitted at bottom. The Heat Transfers From The Tube To The Surrounding Air By Natural Convection. Temperature sensors Measures values At Different Points Including duct temperature. Heat pipe is a heat transfer device which finds its applications in computer system cooling, spacecraft and HVAC systems. 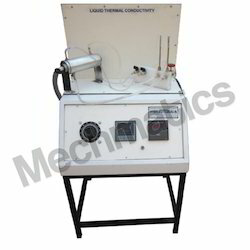 The apparatus aims to determine thermal conductivity of heat pipe and its comparison with other pipes. Heat pipe is made up of SS with partially filled and evacuated distilled water. Pipe lagging is the process of providing insulation to prevent heat diffusion from pipe. The insulating material is normally wrapped around pipes. The apparatus is designed to study the lagging phenomenon. Three concentric pipes are arranged between two supports. The gap between the pipes are filled compactly by two different insulating materials and heater is provided at the center of inner pipe. Temperature at various points are measured with thermocouples. Thermal conductivity is the property of a material to conduct heat. Thermal conductivity of liquids plays a significant role in the cooling of electrical equipment's such as transformers. 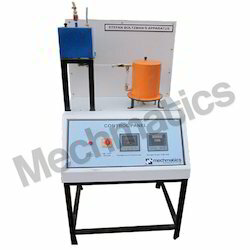 The apparatus setup consist of two concentric cylinder with thin gap through which liquid or gas can be introduced. Set of temperature sensor measures the heat conduction in fluid medium from which its thermal conductivity can be determined. 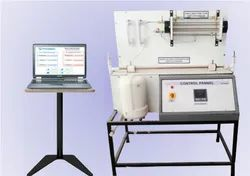 Forced convection heat transfer mechanism is found very commonly in everyday life, including central heating, air conditioning, steam turbines and in many other machines. 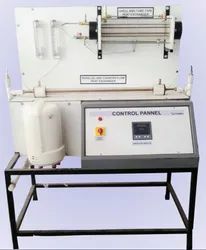 The forced convection apparatus has a Constant speed fan with variable flow control valve The heater is located at the centre of the test section. The forced air flowing through the pipe causes the heat transfer due to convection process. This temperature difference between up and down stream can be determined using the thermocouples placed along the test section. In this experiment the friction factor will be measured as a function of Reynolds number for the flow of air/water through a bed of solid particles. Experimental results will be compared with theoretical predictions for the appropriate flow regimes. 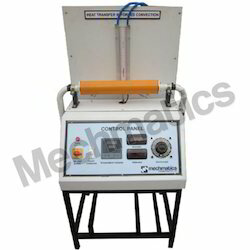 The equipment includes two transparent beds, rotameters, manometers, a source of low pressure air, and appropriate valves and fittings. 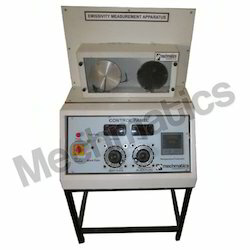 Heat and Mass Transfer range comprises of 30+ products for testing in conduction; convection and Radiation. 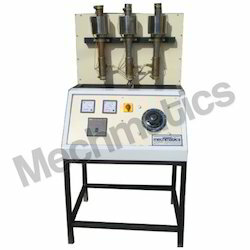 Large variety of Heat exchanger testing rigs are also available. Packed bed is a hollow tube, pipe, or other vessel that is filled with a packing material.The packing can be randomly filled with small objects like Raschig rings or else it can be a specifically designed structured packing. Apparatus can perform three major experiments in convection theory. 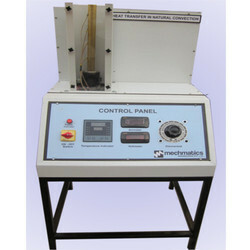 Easy to replace heater arrangement and simple control panel make this unit user-friendly and cost effective. The vertical air duct with a cross-sectional area of 120 x 120 mm2 and a length of 1200 mm is used to guide the airflow over a heated surface. The ambient air enters the duct at the bottom and heated air leaves the duct at the top. The air duct has several measuring glands that enable one to record the temperature at various locations by using an RTD type thermocouple. In addition, a fan with flow sensor blows air into the duct and measures its volumetric inlet flow rate. Two thermistors recordthe inlet and outlet temperatures of the air flow. Other two temperatures in and above heater plate. The rate of heat transfer can increase by extending the surface area. One of the most common methods is by using fins. A pin fin heat sink has pins that extend from the base and it can be cylindrical, elliptical or square.Apparatus aims at studying heat transfer rate from the fin & the fin effectiveness in natural & forced convection.